Wreaths are often made using materials from the garden, including fresh or dried flowers, grapevines, branches and twigs. For many home gardeners, the wreath is not complete, however, until the bow has been added. A simple wreath bow will not take away from the natural beauty of the wreath, but add to it. Bows are also an excellent way to add a seasonal touch to a wreath. 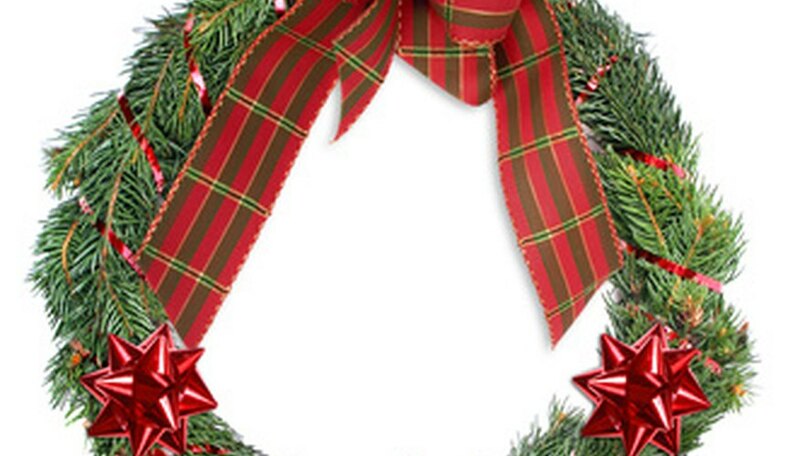 A plain grapevine wreath, for example, becomes a Christmas wreath with the addition of a red-and-green bow, or a Halloween wreath with a pumpkin-patterned bow. Cut a section of the wire and set it aside. The section should be about 3 to 4 inches long. Unspool the ribbon, if it is on a spool. Pinch the ribbon into a loop with one hand, leaving a 12-inch long tail. Make another loop that equals the first loop in size. Make sure the two loops are the same size. Continue to pinch both loops closed. Continue to make equal-sized loops until you have as many as you desire. A simple bow usually has only two or three loops on each side. A full or "fluffy" bow will have about five loops on each side of the center "pinched" area. Make a final, smaller loop about 2 inches long. Take your wire and thread it through this loop, wrapping it around the center of the bow. The wire will now be holding the loops in place so that you can stop pinching them closed. The small loop should be at the center of the bow, hiding the wire. Fan out and open up the loops until the bow is in the shape that you desire. Cut the foot-long tail to the length you want, and then cut the other, still-attached-to-the-spool ribbon to match the first tail. Cut the ends of the tails off on the diagonal for added interest. Attach the bow to the wreath with more of the floral wire. Attach at the top, bottom, or even on the side of the wreath.